Though I know there is a lot more to Computational Thinking than programming. 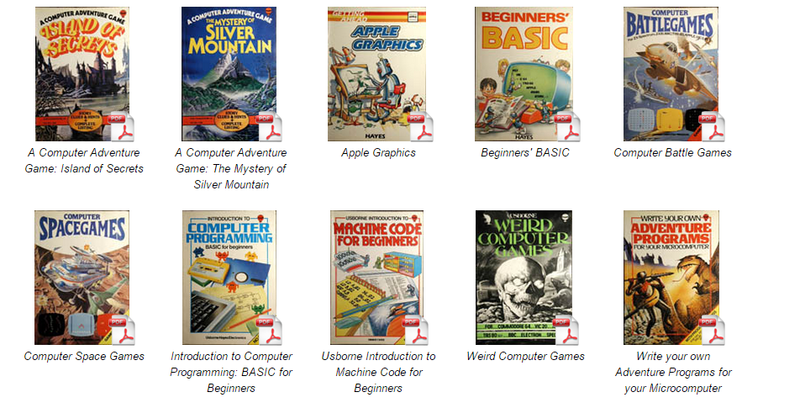 I recently came across a website (http://mocagh.org/loadpage.php?getcompany=usborne-hayes) that has some of the covers of books from the publisher Usborne-Hayes that I used when I started to learn to program and computing. I am not sure of the whether the books are being made available copyright free at the site. Therefore, I am not advising anyone to do download them, but for those who started learning about Computers in the 1980s the covers may bring back a few memories. Apart from that though, the style of the books is interesting and I feel relevant to needs now (even if the languages used may not be as relevant). The reader is taken, step by step, through concepts by cute robots - I am starting to wonder as I writing this whether my own style of teaching computing has unconsciously being inspired by these books.